Each school year JROTC students select a Service Learning Project that is both useful and meaningful to the community. They often target outdoor projects in the spring which gives them the school year to plan, and also gets them out of the classroom after the winter months. Last year, students volunteered time to a spring cleanup project at Sarah’s House. This year with multiple irons in the fire and the program accreditation inspection occurring, they chose a simpler project that was close to home. The students brainstormed multiple ideas, and in the end, settled on repainting the Faculty Lounge at Old Town High School. Throughout the year the cadet staff met and planned the project. They designated some up and coming sophomores, Gracie Sanborn and Sam Koch, to lead the project. Their target week for execution was May 7th to the 11th, which coincided nicely with Teacher Appreciation Week. The students decided that this year, “They wanted to give back to those who help them.” The lounge was last painted eight years ago, and not completely redone for at least ten years. Additionally, the lounge is in a high visibility area of the school and has the potential to impact visitor’s impressions of OTHS. Cadets Sanborn and Koch worked diligently to make this a worthwhile project. They developed a vision statement of, “Promote Civic Virtue through the spirit of association.” The idea was to focus on teamwork, cooperation, and self-improvement while improving the faculty-student relationship. 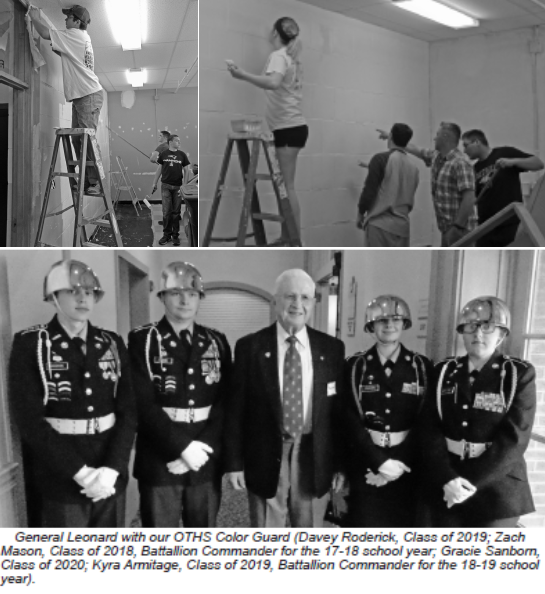 In April they presented the project to both Mr. Gordon, OTHS Principal, and a representative from Second Brigade Cadet Command out of Dix, New Jersey. The cadets took the constructive feedback and applied it to the execution of the project.